No one talks about how lonely and isolated Melania Trump must be? Yes Jackie had to deal with the scandal about her husband’s affairs with Marilyn Monroe, Judith Exner and others, but she had her Bouviers. Hillary Clinton had Bill, but she had her political ambitions and career and Michele Obama was a force onto herself, and an advocate for many causes. 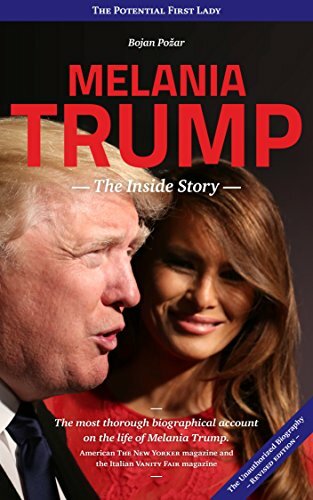 However, Melania seems like a rather sad figure, to quote the title of Robert Heinlein’s famed novel, a Stranger in a Strange Land. She barely speaks the language and the one time she made a significant speech it turned out to be partially plagiarized from her predecessor (“Was Melania Trump’s speech plagiarized from Michelle Obama," USA Today, 7/19/16) Who are her crew? As a model she must have hung around in all the popular nightspots, but when you become part of the presidency you're by nature like the princess imprisoned in the tower. You’re a figurehead who in this case appears like a mannequin at state functions. Admittedly back in Slovenia, she'd be a big cheese, but she's an inhabitant of Washington, New York and Mar-a-Lago. And now with the Trump presidency teetering dangerously ("Michael Cohen and the End Stage of the Trump Presidency," The New Yorker, 4/14/18), she might bear some comparison to Eva Braun inhabiting the bunker with Herr Hitler in the last days of the Third Reich. She’s over the hill as a model and who will hire her when Trump sends her packing? If nothing else the sinking of the Titanic made it clear that even the greatest expenditures of material muscle won’t protect you from the inevitable.